Amazon.com is selling the JVC PICSIO GC-FM1A HD Camcorder for $139.88. 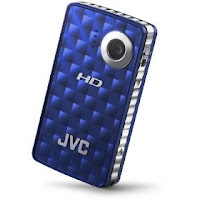 This is JVC's response to the ever popular Flip camcorder brand. It comes in three different colors: Black Ice, Brilliant Blue, and Sparkling Purple - however currently the blue model is the only one at this specific price point. For reviews on the product check out the link above. As for the specs the outside design is obviously much more trendy then the Flip look. The camera has a built in USB connector and charges via the USB - not needing batteries like some Flip models, it comes with software that easily integrates your video with both YouTube and Itunes, and lastly there is image stabilization built into the device.